COS AGENTS RURALS DE CATALUNYA (Catalonia Rural Ranger Corps) believe they have uncovered a bird laundering ring and recently sought the help of the UK National Wildlife Crime Unit (NWCU) to assist them with their investigation. 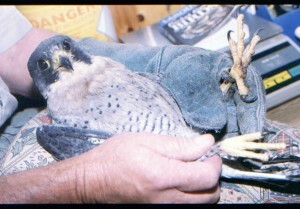 Agents in Spain investigating individuals keeping Peregrine falcons, became suspicious of documentation that they had seized, which indicated that falcons in their possession had been captive bred in the UK. Enquiries by the NWCU revealed that leg rings being worn by some of the falcons in Spain were not the original rings referred to on the documentation. Evidence gleaned by the NWCU suggests that fake rings are being manufactured to match genuine permits. Detective Inspector Nevin Hunter the Head of NWCU said, “Our colleagues in Spain have uncovered significant criminality activity. Cooperation between their Agents and the NWCU has been vital to the success of the operation”. Suspects in Spain are due to appear in court later in the year. For further information about COS AGENTS RURALS DE CATALUNYA click HERE.